Above: Anton Chighur in No Country for Old Men. Below: Jeffrey Dahmer in My Friend Dahmer. All images used for illustrative/critical purposes only. Text and illustrations copyright John Backderf. Preface: I'm taking Rob Salkowitz's class, Visual Narrative and Communication: The Future of Entertainment at the UW. It's exciting stuff! I get to read and analyze comic books. My latest assignment is on My Friend Dahmer by Derf Backderf. This is a class essay, but I think it's interesting stuff, so I'm posting it here. Let me know what you think! In Understanding Comics, Scott McCloud illustrates the picture plane, which plots comics on a spectrum of abstraction, reality, and language. Backderf’s My Friend Dahmer lies near the middle of the representational edge of McCloud's picture plane. It's cartoonish, but neither realistic nor iconic. This look amplifies the perspective of a teenage boy in the 1970s, and it lends itself nicely to Dahmer’s outlandish behavior, particularly his trademark shtick of impersonating a local interior decorator with cerebral palsy. However, it starkly contrasts with the dark subject matter. It makes Dahmer’s sickening acts more digestible, like his habit of cutting up animals. It would be difficult to read a book filled with realistic depictions of these atrocious acts. Backderf often renders Dahmer expressionistically as shadowed or silhouetted, often center of the frame. Backderf's Dahmer lacks emotion. Glasses obscure his eyes. He keeps his mouth shut, with neither smile nor frown. Arms hang at both sides, with his back straightened. He's big and muscular, but tucks his body in towards himself. Backderf's overall portrait of Dahmer paints him as an inhuman monster. He's detached, and though he restrains himself, the reader knows what he's capable of. He's reminiscent of the Coen brothers' Anton Chigurh, the villain in No Country for Old Men. This isn’t a coincidence. There’s universality to the representation of evil. Centered framing feels unnatural, even creepy. Shadowed faces imply nefarious thoughts. Isolating him in the frame shows the villain as apart from all others. These are subjective decisions. Dahmer could not literally be silhouetted- often it doesn't make sense given the lighting conditions established in adjacent panels. But the silhouette evokes a tone. It outwardly conveys the darkness inside Dahmer's head. Backderf uses language economically. He creates rhythm with his words. Some pages have expositional narration, told from the present with knowledge of hindsight. Other pages are pure dialogue. Through weaving past-tense reflective narration with present-tense dialogue, Backderf creates tension and dramatic irony. Present-tense dialogue shows his naivety and inability to pick up on Dahmer’s many red flags. The reflective narration, which at times includes interview quotes from Dahmer in the 1990s, adds context to what was really going on at the time. These multiple tenses and perspectives build a world between the panels, and create psychological insight into what Dahmer experienced in his high school years. To contrast with narration and dialogue, Backderf includes several sequences with no words at all. Most of these feature Dahmer alone. There's little passage of time between panels. We see Dahmer contemplating. Multiple panels with no words and little movement. The panels create tension. “What is Dahmer thinking? Fantasizing? Plotting?” Sometimes the build up is anticlimactic. Other times Dahmer snaps. Backderf plays with the reader’s expectations. These visual narratives are as insightful as the words themselves. They require the reader to fill in the gaps, and infer meaning in the gutter. Backderf maintains that Dahmer, though near impossible to sympathize with, is a figure of tragedy. He went unnoticed throughout adolescence. His parents were too preoccupied with their own issues to give him the guidance he desperately needed. His teachers were completely oblivious to his self-destructive, anti-social habits. 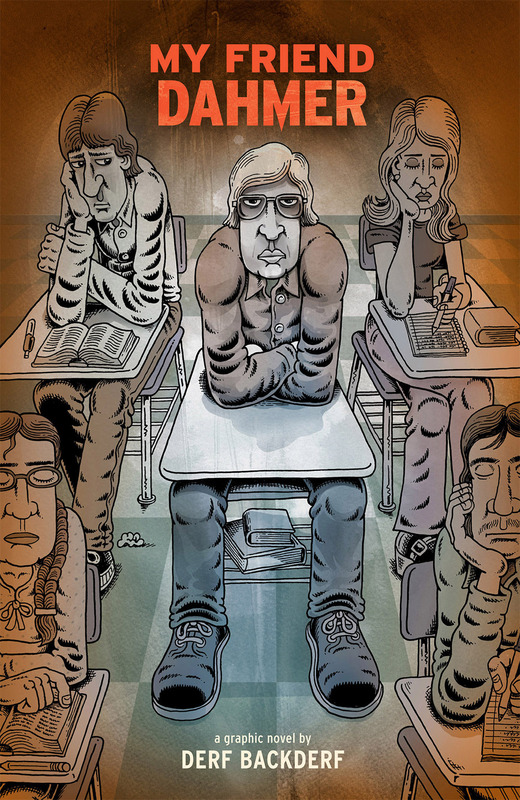 His peers were too self-absorbed and ignorant to realize the depth of Dahmer's troubles. The few who spent some time with Dahmer, like Backderf and his friends, saw him as a "freak show" entertainment figure. “My Friend Dahmer” is a misnomer. Dahmer had no friends. Though they recognized his disturbed nature and bore witness to his perverse behavior, they never reported it to adults for fear of being labeled a "narc." He spent a lifetime of being unnoticed, so he thought he could get away with his horrific crimes. Backderf argues that Dahmer was doomed from an early stage. He was never going to live a happy, successful life. But if the adults in his life stepped in, and if society didn’t fail him, maybe he would not have grown into a monster. As Backderf writes, if someone stepped in to help, maybe he would have grown into a lonely, unhappy loser living in his dad’s basement. That’s not great, but it’s a hell of a lot better than growing into a psychopathic serial killer that took the lives of 17 people. Dahmer is responsible for his actions, but society is partially at fault for allowing him to slip by on so many levels. Backderf makes full use of the comic medium. Sometimes he skips months between panels. Other times he freezes time, lingering on a moment. He weaves perspectives with dialogue and narration. His own memories are aided with quotes from peers, adults, and Dahmer himself. The dialogue captures the tone of being a high school boy in a small town in the 1970s. The artwork is cartoonish, but balances horror, humor, and drama. Backderf argues his philosophy of individual versus social responsibility, while encouraging the reader to think critically and draw his or her own conclusions. Derf Backderf weaves all of this together to tell the coming of age story of a monster.